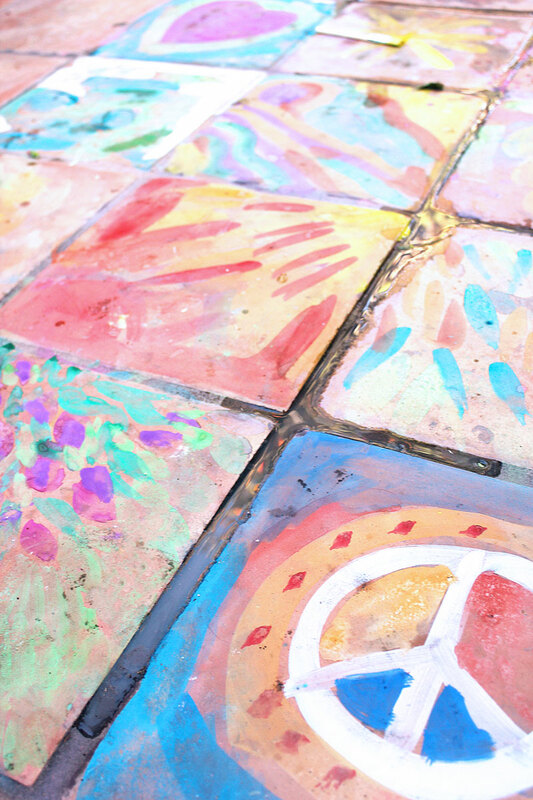 Art ideas for kids don’t get easier than the ephemeral art project I have for you today: Watercolor on Tile. I mean you don’t even need paper people! All you need are watercolor cakes, which pretty much every self-respecting artsy parent has on hand, brushes, and water. And you’re off! I love painting on untraditional surfaces. Call me loco but painting on things other than paper or canvas really changes the way you look at art. Of course everyone loves traditional techniques but once in awhile it’s fun to think outside the box simply by suggesting a novel way to create art. Today’s project does just that. And if you don’t have tile try this on concrete! This is one-step project! Simply wet the watercolor cakes with water and paint! Because it’s watercolor, the paint will eventually fade away when washed with water. The Spanish Village Art Center. If you have been to San Diego, Balboa Park is a not-to-miss destination. And for me the highlight of the park is the tile paving at the Spanish Village Art Center. It will blow your mind. Thousands of colored flagstone tiles adorn this mini village of artist’s studios. It’s such a simple way to completely transform a space and I never forgot it. In fact it absolutely the inspiration behind today’s project. I love ephemeral art ideas. So much of the time we think of art as precious but often the process of making or the temporary nature of an installation gives us more freedom to play. 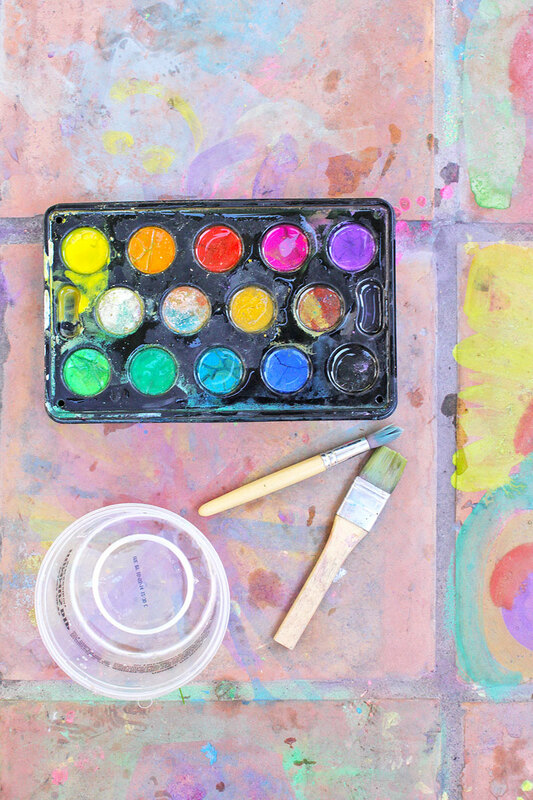 Kids and adults forget they are making art and focus on having fun. That simple permission to just try something without worrying about whether it will look good or not is one of the best ways to open up your creative spirit. 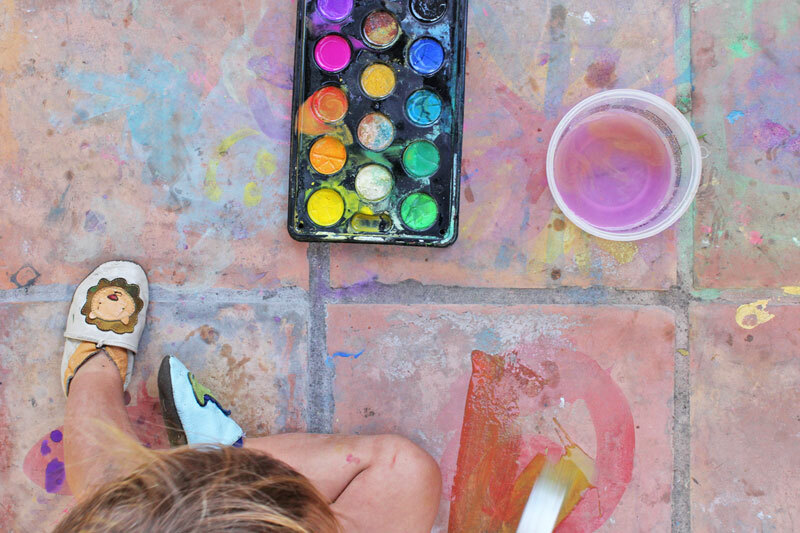 Painting on tile with watercolors, a decidedly impermanent art piece, is a simple way to tune into your inner artist and at the same time add a fanciful, temporary touch to your patio or schoolyard. For more process art get advice from a pro like Meri Cherry! And if you love making process oriented art with kids, especially younger ones YOU MUST OWN THIS BOOK! You will love it, I guarantee it! Oh, this looks like so much fun! Love how there is no cleanup.